At the end of June 1950, the Democratic People’s Republic of Korea (DPRK)— North Korea—through the actions of the North Korean People’s Army embarked on an invasion of South Korea by advancing toward Seoul. This action signaled the beginning of the Korean War (1950 – 1953); and was the first military act of the Cold War (1948 -1989) (History.com, 2002). Three years after the war had commenced the Republican Party in the United States of America (US) came to power largely on a pledge to end the war in Korea, and when North Korean and Chinese forces had been pushed back to near the thirty-eighth parallel by United Nations (UN) forces the war ended in a “stalemate” (Kolko, 2002). Since 1953, the US has deemed North Korea to be a “rogue nation/rogue state” (see Notes). From the perspective of the North Korean government however, the war for the unification of their nation remains an ongoing and constant part of their political landscape. Both of these standpoints have come to the fore in numerous ways in the decades since 1953. [Rogue] States like these, and their terrorist allies, constitute an axis of evil, arming to threaten the peace of the world. By seeking weapons of mass destruction, these regimes pose a grave and growing danger. They could provide these arms to terrorists, giving them the means to match their hatred. They could attack our allies or attempt to blackmail the United States. In any of these cases, the price of indifference would be catastrophic (Bush, 2002). North Korea’s choice of allies, and the ongoing threats of Kim Jong-un, continues to underpin and inform the current crisis. Nevertheless it should be stipulated, North Korea does have regional allies and this allows the nation to survive economically, militarily and politically. Politics and Economics: How Does North Korea Survive? For all of its belligerence and pontificating North Korea does receive direct or by proxy support from regional allies as it is fair to argue, no country in a globalized world is able to be completely isolated. Whilst it is true that China recently criticized North Korea for its nuclear test in September 2016, the regional strength that North Korea possesses does essentially, hinge on China’s largesse (Albert and Xu, 2017). The support from China emanates from the political, trade and energy avenues that exist through the cross-diplomacy and other auspices of the Chinese government. China therefore, is considered by the international community to be a ‘buffer state’ for North Korea (Dor, 2015). Another regional ally is the Russian Federation operating through the prism of “mutually beneficial cooperation” (Zakharova, 2016), and this offers North Korea an economic and political lifeline, and similarly with the transnational companies utilizing cheap North Korean labour in the Kaesong Industrial Zone (in conjunction with the South Korean government), at the southern end of their border (BBC, 2016). All contribute to a lifeline for North Korea and in part this has allowed North Korea to build and maintain a missile- and nuclear-program. North Korea’s definitive and strong regional presence through its missile- and nuclear program occurs in defiance of international norms set down by the UN and the UN Security Council (UNSC). Any deviations and the corresponding threat and potential for destabilisation are assessed and addressed by the UNSC through UN Chapter Vll (United Nations Charter, Article 39) which stipulates, ‘The Security Council shall determine any threat to the peace, any breach of the peace, or act of aggression…’ however to date, the UNSC has not deemed North Korea to be dangerous enough to approve a direct kinetic action; or to be a serious threat to regional peace. North Korea has persisted with its belligerence in the decades since the end of fighting and whilst the hostilities have not ended the continuum of the missile- and nuclear-program has reached a troublesome point in the mindset of the West and regional actors—Australia, Japan and South Korea in particular. The fact that the UNSC has not approved direct action does not reflect a neutral stance as North Korea is currently under the caution of UNSC Resolution 2321 (United Nations Security Council, 2016) which condemns North Korea’s nuclear test of September 2016. To be sure, the current fear that has been generated does have solid antecedents to the possibility of a kinetic outcome as the posturing of North Korea is relentless, and moreover in 2009 it stepped away from the ‘Six Party Talks’ which began in 2003—involving China, Japan, North Korea, Russia, South Korea and the US—which were designed to dismantle its nuclear program (Ling, 2012). Since 2009 however, tensions have continued to rise and North Korea has contributed persistently to regional tensions by maintaining its nuclear program as well as conducting regular short-, intermediate- and long-range ballistic missile test-flights and these tests have prompted comment from China and Russia which have in recent times articulated a more considered approach to regional frictions (Nuclear Threat Initiative, 2016). For instance, Russia continues to condemn North Korea’s nuclear program, and ‘in March 2013, China finally agreed to sponsor UN sanctions alongside the United States and since then has steadily increased a call for the ‘resumption of [Six Party] talks (Bajorta and Xu, 2013).’ Although China and Russia remain perturbed about North Korea’s belligerence and the missile program in particular, they maintain that bringing North Korea into more fruitful negotiations is the most appropriate recourse for a peaceful solution. North Korea remains steadfast in its regional ambitions and exercises its sovereign independence via a military stance. The election of Donald Trump as President of the US has brought about a change in which the US views North Korea. The change it is fair to argue, is one that adheres to the political overtones of the mid-1990s Project for the New American Century (PNAC) which was designed to re-establish US preponderance after the perceived mid-1990s International Relations failures of the Clinton administration (1993 – 2001) (See Notes). The rhetoric President Trump is using follows a core PNAC tenet of ‘we [the US under a Republican administration] need to … challenge regimes hostile to our interests and values.’ The political dynamic is one of the US being more pro-active about threats as suggested in the PNAC document, and for the Trump administration (as with the Republican’s in the 1990s), the newfound focus on North Korea has its legacy in the recent past. Underpinning US’ change in attitude and a corresponding more forceful approach is the political-memory and perceived malaise of the Obama administration when dealing with North Korea. The way Obama dealt with North Korea was through the prism of ‘strategic patience,’ which included consultations with the US’ regional allies (read: Multilateralism) (Synder, 2013). The Trump administration’s stance has brought to the fore numerous political tenets that it feels it must confront in order to differentiate from the ‘outstretched hand’ of the Obama administration. The approach by Obama was one of setting a overall new tone for US foreign policy and incorporated a more bilateral approach to rogue states such as North Korea (Cotudi, 2016). Trump seeks a foreign policy approach, especially with North Korea, to be replaced with more of a ‘clenched fist’ approach (read: Unilateralism), and this encompasses recalcitrant countries being shown direct US force or a threat-of-force. Notwithstanding the new approach and whilst it may be the opposite of the ‘America first’ rhetoric of Trump’s presidential campaign which was focussed on ‘a foreign policy based on American interests’ is a moot point and need not be discussed further as what is most relevant, is the way in which Trump has changed the political landscape (White House, 2017). Essentially, the Trump approach involves, but is not limited to, reducing Realpolitik as a means-to-an-end; the US will remain a forthright actor in the region; any change in the balance of power, often referred to as ‘brinkmanship,’ will be met with decisiveness and if need be overwhelming force; and finally, will offer an assurance to US’ allies in the region through an elevated military presence (Bremer and Cusack, 1995). As with all crises there are not only international frictions that dominate a situation and there are always domestic factors that play a part. For the Trump administration and from a domestic perspective, moving a US Navy strike group toward the Korean Peninsula shows a more ‘hands on’ president is in control of America’s geo-strategic gambit; sends a clear signal that a departure from the indecision and tolerance-base of the Obama administration no longer exists; that the use-of-force is on the Trump administration’s agenda; and that US preponderance has been reinvigorated. All aspects are it is fair to argue, are given credence by US National Security Advisor McMaster who recently stated “… the president has made clear he is prepared to resolve this situation one way or another” (Agerholm, 2017). For Kim Jong-un and the North Korean military the influences that drive their domestic polity are that North Korea’s status as a military power is robust; regional preponderance is an ongoing part of domestic and international politics; should brinkmanship increase the US and its regional allies will be confronted militarily if the need arises; the nation will eventually be reunited by force if need be; and the sovereign nation-state of North Korea will not be influenced by military asymmetries in the regional power-stakes. There is much to be taken into account in order for a kinetic exchange not to occur as war is a circumstance that can rapidly spiral out of control for belligerents as the strategist Clauswitz observed, ‘war is subject to no laws but its own’ (Clauswitz, 1832). The fear of a limited-strike by US forces which would be designed to bring North Korea to heel and of it escalating into a ‘limited war’ are considerable, as it is generally accepted that North Korea would respond with a barrage of missiles. The limitations on the part of the US would entail how much to commit in order to maintain its advantage and this would create a dilemma as the US would have to come to terms with what Vasquez sums up as ‘the objectives sought; the weapons and manpower employed; the time, terrain, and geographic area of hostilities; and the emotions, passions, and energy, and intellect committed by a nation’ (Lewis, 2007). In simpler terms the Trump administration would have to take into account how much the US’ populace would be willing to commit without there being a backlash to the ‘America first’ policy. Whilst a limited war may have some immediate successes there is always the possibility that it could develop into a ‘total war’ (Vasquez, 1993)—especially if a ‘pre-emptive military action’ was launched by the US—and a ‘knock-on’ effect would indubitably be, the US being blamed by the UN General Assembly for the happening (Osborne, 2017). A development of this type would ‘take on the characters of a fight for survival, they tend to mobilize resources and means to wage battles with few restraints … The goals in total wars are much more open-ended and often expand as the war progresses. Total wars often demand the complete overthrow of the leadership of the other side whether through the demand of unconditional surrender or total annihilation … ’ and such a catastrophic event would inevitably draw in other actors. As the US is deemed the most ‘mature nation-state’ in the current machinations a kinetic exchange would by necessity, create a situation from which the US would be incapable of political extraction. Furthermore, a unilateral action that was not approved of by the UNSC Permanent Five (See Notes),—a body-politic that comprises Britain, China, the Russian Federation, France, and the US—would assuredly move China and Russia to condemn the US outright; and ensure severe political responses from Britain and France. Concomitant and reinforcing the current state-of-affairs and because of North Korea’s limited, military capabilities by comparison to the US, China’s Foreign Minister Wang Yi recently stated that there can be ‘no winners’ in a war between North Korea, the US and South Korea (ABC News, 2017). In 2013 the (then) US Secretary of Defense Hagel, stipulated North Korea was a ‘clear and present danger to the United States’ and in 2017 (Witt and Town, 2013), the US was ‘having a big problem with North Korea (Reuters, 2017). Whilst both comments acknowledge that the US has over time continues to observe North Korea as a rogue state, the rhetoric has been moderated recently from the original tension-filled position to one of President Trump exclaiming he would be ‘honoured’ to meet Kim Jong-un under the ‘right circumstances’ (Diamond and Cohen, 2017). Whilst there is no guarantee that a kinetic exchange between the US and North Korea will not take place, the situation remains fluid, as neither actor has reinforced their rhetoric beyond anything other than a requisite ‘display of power’ to pacify their domestic audiences and in the case of the US, its regional allies as well. The US moving the USS Carl Vinson strike group near to the Korean Peninsula (Helmore, 2017), and the North Korean government warning that it is ‘ready for war’ (Osborne, 2017). Therefore, within the current dialogue—rhetoric- and tension-filled as it is—the chances of a war breaking out is diminished considerably as the exchanges signify that no actor is willing to lose the regional power-stakes. Remaining hostile and its requisite show-of-strength does not necessarily end in kinetic action; and moreover is a necessary part of preponderance. Russia moving troops to the Finnish border in World War Two (WWII), China on numerous occasions moving troops and matériel to coastal facilities near Taiwan, and Britain moving a permanent garrison onto the Falkland Islands/Islas Malvinas after the Falklands War/Guerra del Atlántico Sur (1982) are several examples of ongoing hostilities not evolving to outright conflict. As with any political situation there are also hidden elements that drive the need for an actor to increase pressure on a belligerent. Whilst North Korea does have a reputation for being pugnacious, even to its closest ally China, there are nevertheless inconsistencies in how North Korea is represented by the West and this factor needs to be acknowledged. The claim that North Korea is isolationist is misleading as it has well-entrenched ties with China, the Russian Federation, and based on the comments of President Bush, also has a connection with Iran. This is not a sign of a politically-isolationist sovereign nation-state and it is fair to argue, the West—the US in particular—has difficulties with the geo-strategic allies that North Korea has chosen are as problematic as the concerns of missile-strike capabilities. There is another enormous issue driving the US’ need to be rid of the ‘rogue’ state of North Korea and it is the production of counterfeit US one hundred dollar bills—so-called ‘super dollars’—which North Korea has been producing since the 1970s, and are for all intent and purpose, indistinguishable from genuine US currency—a flood of this currency onto the world market would pose a serious threat to the US economy (Hwee, 2009). There are other extenuating circumstances that would impact on the US if a war were to break out. The US’ post-WWII dominance of the region would be weakened due to US losses as well as South Korean. The effect any losses would have on the US and South Koreans cannot be underestimated in terms of what they would introduce into the region. A war could result in but not be limited to a reduction in the overall regional power of the US; allow China to gain an immediate exponential geo-political and geo-strategic advantage; offer an opportunity to the Russian Federation to gain greater regional geo-political and geo-strategic footprint; include European Union involvement in future political stability; and motivate other actors to assert their regional demands in the face of a weakened US. All of the above mentioned hold the US back from striking North Korea, whether it be preemptive, tactical or strategic. Whilst the ongoing threats of Kim Jong-un to destabilize the region politically, if the US thought North Korea posed an overwhelming threat to US and/or regional security, it would have acted (unilaterally) earlier in the twenty-first century—possibly as early as 2002. Currently however, the US and North Korea are both intent on winning the hostilities without going to war. The UNSC P5 also has 15 ‘observer nations’ which share voting influences and are selected on a revolving basis, however these nation-states do not have the right of veto in the assembly. See: UN.org. ABC News, ‘North Korea: War with North Korea can bring no winners, China says.’ ABCnews, 18 April, 2017. Agerholm, Harriet. ‘US national security adviser says ‘be prepared for military action against North Korea.’ The Independent, 1 May, 2017. Albert, Eleanor and Beina Xu. ‘The China-North Korea Relationship.’ Council on Foreign Relations, 26 April, 2017. Bajorta, JayShree and Beina Xu. ‘The Six Party Talks On North Korea’s Nuclear Program.’ Council on Foreign Relations. 30 Sept, 2013. BBC News, ‘What is the Kaesong Industrial Complex?’ BBCnews. 10 Feb, 2016. Bremer, Stuart and Thomas Cusack. The Process of War. Advancing the Scientific Study of War. Australia: Gordon and Breach, 1995, 97. Bush, G.W. ‘Speeches by US presidents, 2002, George W. Bush.’ State of the Union Address Library. Bush, G.W. ‘Text of President Bush’s 2002 State of the Union Address.’ The Washington Post. 29, June 2002. Clauswitz, Carl Von. Vom Kriege: Hinterlassenes Werk des Generals …(Gebundene Ausgabe)Dümmlers: Verlag,Berlin, 1832. See: Karl von Clausewitz. On War. Edited by Anotel Rapoport. Translation by Routledge & Kegan Paul Ltd, 1908. London: Penguin Classics, 1982, 402. Cotudi, Maria. ‘The limits of “strategic patience”: How Obama failed on North Korea.’ NKNews. 2 Nov, 2016. Diamond, Jeremy and Zachary Cohen. ‘Trump: I’d be honored to meet Kim Jong-un under ‘right circumstances.’ CNNpolitics. 2 May, 2017. Dor, Alexander. “North Korea’s Growing Isolation,” The Diplomat, September 5, 2015. Greene, Andrew. ‘North Korea threatens nuclear strike against Australia if it doesn’t stop ‘blindly toeing US line.’ ABCnews. 22 April, 2017. Helmore, Edward. ‘Tillerson: China agrees on ‘action’ on North Korea as navy strike group sails.’ The Guardian. 10 April, 2017. Hwee, Moon Sung. ‘Super Notes Still in Production.’ Daily NK. 6 April, 2009. Jackson, R. and Georg Sorensen. Introduction to International Relations. Theories and approaches. Oxford: Oxford University Press, 2003, 38. Kolko, Gabriel. Another Century of War? New York: The New Press, 2002, 92 – 93. Lewis, Adrian. The American Culture of War. The History of U.S. Military Force from World War II to Operation Iraqi Freedom. New York: Routledge, 2007, 203. Ling, Xiaodon. ‘The Six Party Talks at a Glance.’ Arms Control Association. May, 2012. Nuclear Threat Initiative, ‘North Korea. Nuclear.’ Nuclear Threat Initiative. Sept, 2016. Osborne, Samuel, “North Korea says it is ‘ready for war’ with Donald Trump’s United States,” The Independent, March 21, 2017. Snyder, Scott. ‘U.S. Policy Toward North Korea.’ Jan, 2013. United Nations, Security Council Strengthens on Democratic Republic of Korea, Unanimously Adopting Resolution 2321 (2016).’ 30 Nov, 2016. White House, ‘America First Foreign Policy.’ The White House. Wit, Joel and Jenny Town. 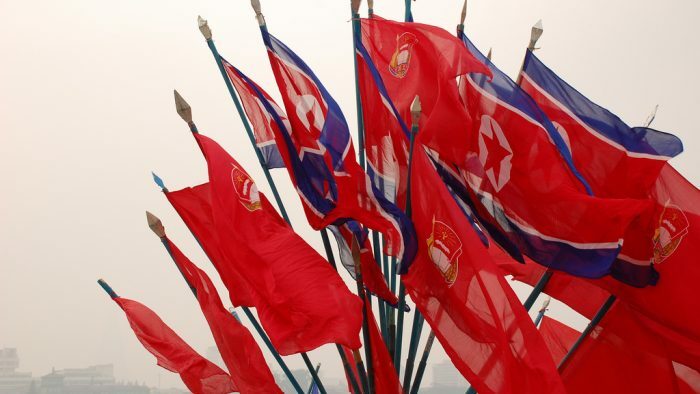 ‘7 Reasons to Worry About North Korea’s Weapons.’ The Atlantic, 16 April, 2013. Zakharova, Liudmila. ‘Russia-North Korea Economic Relations.’ Joint U.S. – Korea Academic Studies. 2016, 210 – 215.